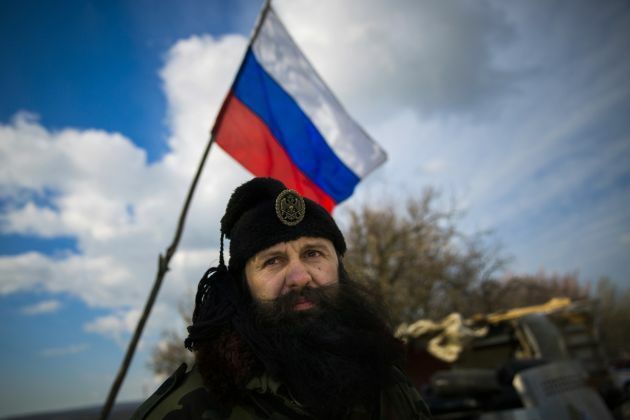 (Photo: REUTERS / Thomas Peter)Bratislav Zivkovic, a member of a Serbian Chetnik paramilitary group, mans a checkpoint on the highway between Simferopol and Sevastopol in the Crimean peninsular, March 13, 2014. Serbian paramilitaries have offered their help to pro-Russian self-defense volunteers who set up road blocks on the main road to the Crimean port city of Sevastopol, home to the Russian Black Sea fleet. Road blocks were set up last week when pro-Russian men in green uniforms without insignia started appearing outside bases taking control of naval and military installations in Crimea. BAKCHISARAY, Ukraine (Reuters) - Bearded men in camouflage uniforms and black fur hats and armed with knives, were checking traffic on Thursday along the busy road linking Crimea's regional capital of Simferopol and the naval port of Sevastopol. Bratislav Zivkovic, one of the commanders of Serbia's Chetnik movement, an ultranationalist group with roots in another era, said it was only natural for them to come to Crimea to help their Russian brethren. Zivkovic's group of five activists have been tasked with manning patrols alongside Cossacks, most of whom have journeyed to the peninsula from Russia in anticipation of the referendum. "Our motive was to offer moral support to the Russian people of the Crimea and their right for a referendum and nothing more than that," said Zivkovic. "Through the centuries, Russians were helping us, they were giving us support, even now in Kosovo, so we came here to support them." Russia is Serbia's traditional ally as the two nations share the same Slav origins, Orthodox Christian faith and similar languages. Serbia is also heavily dependent on Russia's energy and the cash-strapped government in Belgrade has turned to Kremlin to underpin its budget. The checkpoint manned by Zivkovic's men was also controlled by masked men in camouflage fatigues armed with shotguns, who described themselves as Cossacks. A group of policemen in Ukrainian uniforms, all carrying machine guns, stood aside, ceding control to the Serbian volunteers and Cossacks. Zivkovic said his men were willing to fight to ensure the peninsula's ethnic Russian majority won the right to secede and join Russia. But they were there, he said, to prevent violence. "Every possible incident that might occur will be extinguished swiftly," he said. "We are hoping that even if it comes to fighting and armed conflict, it will be very short, because the population is Russian and the peninsula is Russian." "This is great. They are helping the guys," he said. "This is how it should be. We have to help each other." "Who are they helping? I don't understand that. I don't need any help, no one is bothering me here," said Denis, a driver from Simferopol. "The (Serbs) are occupiers, genuine occupiers. I have no other names for them," said Asan, another driver.